NATHAN DECASTRO Vs AGOE ASHONG ON 29TH SEPT.
Decastro Fires Warning Shot Across Ashong's Bow Ahead of Commonwealth Title Clash on 29th September. Unbeaten Super Middleweight prospect Nathan Decastro vows "No one can stop me on my journey"
Bardley. 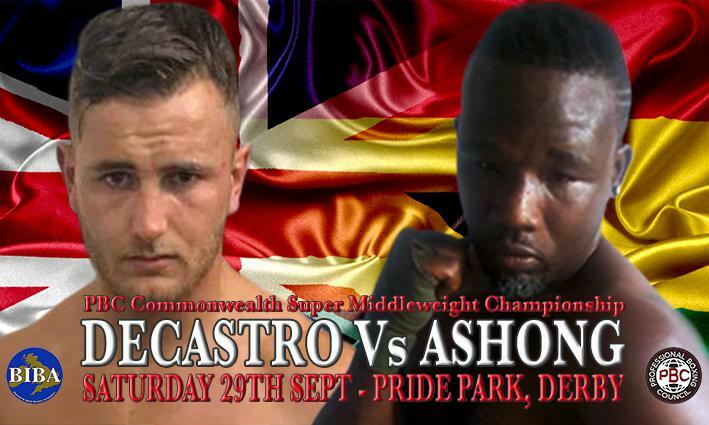 Lincolnshire's Decastro is set to face two time African Champion Agoe Ashong for the Professional Boxing Council (PBC) Commonwealth Super Middleweight Championship, on the Dan Gray promoted event at Pride Park in Derby on the 29th September 2018. Decastro, who is ranked #12 in the International Boxing Federation (IBF) Intercontinental ratings, was originally due to go toe to toe with Ashong back in July on the undercard of the McAllister versus Williams WBU Heavyweight World Title clash headed event in Aberdeen, however due to delays in the African Champion receiving his visa in time, Decastro instead had to settle for a non-championship eight rounder against David Okai. Late in August Ashong's visa situation was finally sorted thanks to the intervention of the Secretary of State for Immigration, Caroline Nokes MP and James Snowdon and his team at the Home Office, making it possible for this mouth-watering 50/50 title clash to finally take place. "I am so pleased to get the opportunity to fight for the PBC Commonwealth title and really excited for this fight, especially after the disappointment of his visa issues last time, therefore not making the scheduled fight! "That’s behind me now and it’s all sorted, I’m going to make a big statement next week and show I really mean business and deserve my IBF ranking and a shot against any of those ranked above me for the vacant IBF Intercontinental title. "Agoe Ashong is a quality fighter and that’s proven with his record 11-1 and the two African titles he’s won, but for me to progress towards world titles and improve my ranking with IBF I need to be winning in great style. "I've been promised a huge fight in December, by my manager Lee McAllister as long as I win on the 29th, which I fully intend to do. "I would just like to thank my traveling supporters and also my team and Sponsors: Bracebridge Boxing Club, Tudor Building and Roofing, Flawless Landscaping and construction, Aesthetics by Megan, GA Luxury Breaks, Get The Edge UK, SMT2U, Sam Vickers my S&C coach and Craig Barton my nutritionist! "I’m in a great place right now and feel like no one can stop me on my journey"